Four months after the epic three-game trial of Neku Sakuraba that helped determine the fate of Shibuya, the city is a far cry from its ailing form a month prior. Now dubbed an optimal parallel reality by the Angels, only one thing remains of the danger that once threatened the city: the Fallen Angel, Sanae Hanekoma. His charges: establishing a Taboo Noise refinery sigil, collaborating with forces hostile to the Composer, and endangering the lives of Players, Reapers and the whole of Shibuya through his interference in the struggle between Composer and Conductor. Four months after these tumultuous games, following what appeared to be a leisurely expedition through many planes and places, Hanekoma was captured and dissolved down to the level of pure Soul, and scattered to the winds over Shibuya. A dear friend and confidante of Hanekoma, Mitsuga Indou, was involved in his chase and trial. Deeply torn between a where his diverging senses of justice and duty would lead him, he spoke privately with Shibuya's composer following Hanekoma's execution. Although Hanekoma's criminal actions were ultimately necessary to Shibuya's survival, Yoshiya Kiryu chose to remain silent in Hanekoma's trial, fearing that the knowledge of his collaboration would see him stripped of his rank as Composer, with all Shibuya's recent growth gone with it. Outraged by what he saw as a man merely trying to save face and rank, Mitsuga left while forming a two-fold plan that came to fruition a month later. Eluding the Composer's foresight, the coup d'etat involved Joshua's assassination, immediately followed by the initiation of a Reaper's Game. Mitsuga's goal was to gain control of Shibuya, seal it from the outside world, and destroy it from within as retribution for Hanekoma's fate. Due to Joshua's death, Shibuya immediately went into lockdown, though Mitsuga naturally adopted the role of the Composer. Meanwhile, with a Game started, further barriers were established within and around the city. He seeks to collapse the three Shibuyas of the UG, RG and Noise realms into one, destabilising the city and unleashing chaos on the world, and he needs only a single day to do it. Exactly what effect Shibuya's fusion or destruction will have, no one knows, but it is one of the fulcrums about which the world turns. Generally, you will be one of the Players involved in this Reapers' Game. The city is currently too well-protected for outside forces to penetrate and take down Mitsuga. It's up to the Players, and other assorted characters, to outright stop Mistuga, or buy enough time for help to arrive. 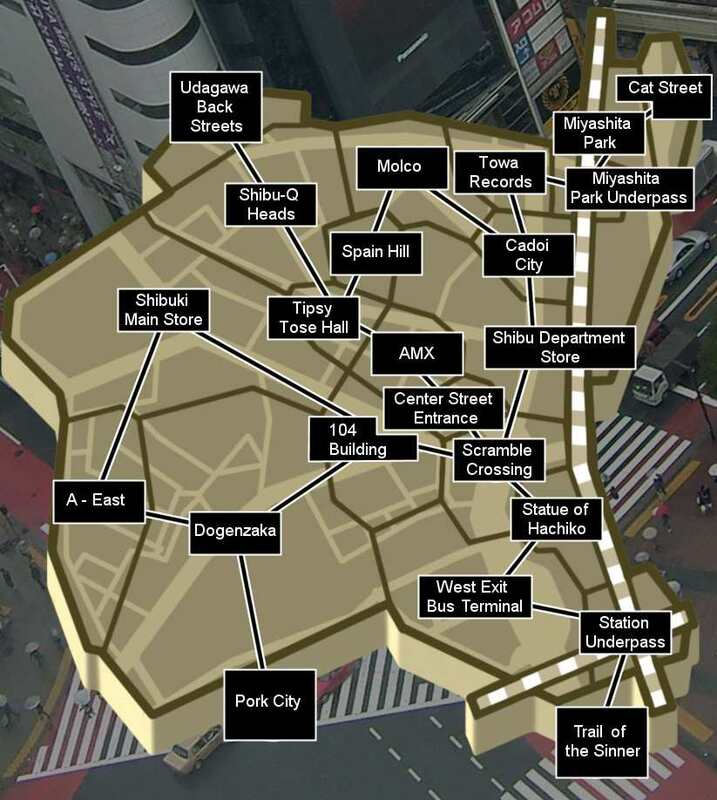 Mitsuga's plan relies on physically harmonising the three levels of Shibuya before fusing them, and key to this are certain landmarks throughout the city. By claiming or otherwise destroying things such as the Hachiko statue or the 104 building's towering screen, the Players can hinder Mitsuga's progress, but the success of such efforts is not guaranteed. Some might see better chances in going straight for Mitsuga himself. Due to the sudden take-over, not all Reaper officers or high-rankers are necessarily opposed to the players or in agreement with Mistuga and his Game Master. The Producer, whose role it is to make sure Reapers and Players play fair - usually according to the rules of the Composer - is tenuously opposed to the Composer and his Game, for it is deliberately stacked against the Players from its inception, and of course Shibuya's fate is hanging in the balance. Traditionally, the Conductor is the go-between for the Composer and Reapers, but the events unfolding in Shibuya means the Reapers are acutely aware someone else is giving the orders from up high. Depending on the Conductor's side in the conflict, they may be able to sway Reapers from the Composer's goal. Positions available: Conductor, Producer, Friendly Reapers (very few), Players. Experienced roleplayers may apply for the Conductor or Producer roles with my permission. The two of you will be playing a much more hands-on role than you might in a more typical game. Role: According to above, if Reaper, list rank as well. Price: As a Player, what your character gave up or was exposed to in order to join the game. Background: A little information on, say, what made your character's price so dear to them, and the rough details of their death. We don't care for a blow-by-blow description of those events, though. Personality: Some level of consistency is preferred. Unexplained contradictions in character traits will most likely not be accepted. Pins: Up to three brands allowed, maximum of six pins. Players may create one custom pin, with my permission and consultation. Hey! One of my first times at making a character here, so let me know if it's alright. Oh, and her last name is in parentheses because she doesn't remember it herself. Yukira stands at about 5’4’’ with brown hair reaching to her shoulders when loose. She has hazel colored eyes and has a healthy body. She dresses very simply, and is seen to be a bit of a tomboy, although she does have her own feminine interests. Her hair is usually up in a short ponytail, and she’s usually dressed in simple jeans and shirt. She wears tennis shoes for flexible movement. Yukira had a happy life- she loved her family, just as they loved her back. Her parents and two younger siblings were her world. As the oldest of three, she was the responsible one, and she made sure to be a good role-model for her siblings, a 12 year old sister, and 14 year old brother. Sure, they got on her nerves at times, but she loved them all the same. And her family wasn’t completely well off financially, either- but they pulled through the tough times, with Yukira often helping out with a part-time job in addition to school. Everything she did was for her family. She had no idea what she would do without them. Everything was blank after that, and she woke up in a strange, white world, approached by a man who explained the game to her. In return for what she held dearest, she had the chance to return to life. Instantly, she accepted, determined to return to her family, unaware of what “giving up what she held dearest” would mean, and how that would affect her. Yukira, since entering Shibuya, has been like a ghost who has lost its soul. Her face is one of someone who used to know great joy and happiness, but has lost it. Though she tries to act otherwise when she’s around other players. Despite this, she hasn’t lost her good character and willingness to help others. She’s willing to help other players win the game and return to their own lives, and when she sets her mind to something, determination takes over. A tomboy in many senses, she is quite fit, and has some skill and strength from doing heavy duty work when she was still alive. Price: The memory that defines his reason to live, and without it, has none. He stands at an abnormal height of 5’9… taller than most individuals and his sense of style is reminiscent of a Gothic stereotype only instead of cargo pants he wears black or blue jeans, his shoes are also black skaters with white edges along the bottom of the foot. Background: Renn was a transfer student from Canada, and upon a stroke of luck he got to go to one of the places he liked most. When he arrived he was really happy because he loved the culture, the fashion, and the food of Japan. In short he was an otaku. He developed only one friendship at his new school with a girl named Miki. But he was happy because he had a friend (<- Hint). His life was pretty normal before the foreign exchange program. Although he had great grades and was often friendly, his nature often got him into fights either with his sarcastic tongue or because someone was picking on someone else. Although he held his own most of the time, He was still worried about such things happening. He had a sudden pain in his back and he knew what had happened, He had been shot. His vision faded, and he fell on top of the decoy. He felt two more jolts of pain before he said: "Miki... Run... Now..."
Personality: Renn's personality is more introverted because he doesn’t like social interaction much or at least he doesn’t seem to. His nature is also very chaotic or contradictory because he can go from being a loner to a socially awkward butterfly upon many different conditions or he can have a balance of the two, which is commonly a smart, friendly, young man which is his most common persona. He has the chaotic nature of Deadpool only a lot less insane, at least until he gets into a fight. Dragon Couture: Pins 158, 154, and 165. Saphexteni, Yukira is accepted, but take a quick look at the amended notes for 'Background' in character creation. Shinra, I'll need you to work on Renn before I consider accepting you. His price mentions nothing specific of what he actually lost, nor does his background give any information on why it's so important to him. That, and in the grand scheme of things your background prattles on a lot. The way you've constructed his personality could also use some refinement and consistency, especially with the whole idea of him just switching between two polar opposite social types. That's why I hinted to Miki's friendship, His price is his entire memory of her... and although he doesn't expect it... Miki means alot to him. His Health. Since he used to be thankful for his immune system and being noted as someone with great physical capabilities in school due to his training and dream of being an Olympic gymnistor runner (he just knows he wants to go to the Olympics), he valued his health and physical condition considerably. And as such, was his price for entering The Reaper's Game. Cursed with a heart condition that appears under times of extended or extrenuous physical activity (i.e. fighting, running, NECESSARY in playing The Reaper's Game), it also comes with side effects such as difficulty breathing and cramping of limbs such as his arms and legs. Kuno is part Native American, Creole, and Japanese. His mother was Japanese and he receive most of his father's more dominant traits. When Kuno was very young, his family went to Shibuya as part of the vacation they took to Japan. His mother was taken from him as the result of a horrible car accident. His father deemed it best that Kuno didn't return home as to stay closer to the place he felt connected to his wife. This actually worked in just the opposite as Kuno's father began to become detached and solemn. However, he tried to make the best of his single parent situation and strived to become successful in some way and to be on TV doing something so he could make a name for his family. Now living in Shibuya, he went through the motions of schooling and finding he wasn't good in acting or entertainment, he would have to do something regarding to sports. After watching the Olympics, he discovered that if he trained and dedicated himself hard enough, he would be able to become successful through obtaining an Olympic Medal, one of the greatest achievements one could ask for. He regularly began to excercise in his freetime, found friends to practice freerunning with, and tried to keep his body and mind as trained as possible....y'know for a 16 year old. At the conclusion of one of his freerunning spells, celebrating with a couple of friends, he found one got too rough with the other, and in the ensuing struggle that followed, all he could hear was: "Dude! Dude! DUDE! ", as he began falling from the top of an apartment complex onto the concrete below. Kuno is one happy person, or...at least was. He tries to keep as happy as possible, however his circumstances have led him to think...a little less happier. He is a very dedicated, and perservering person, a mindset that was established through his countless hours of training and preparing himself. Therefore it is very hard to keep him down, or make him give up very easily, however, his newfound condition could put a wrench in that attitude. He begins to start to become slow to trust other, due to the circumstances of his death. Kuno's fighting style consists of quick movements and a balanced mix of long, mid, and close range attacks. In fighting he tries to do the least amount of physical activity as possible, and wear down the opponent as quickly as he can. Therefore, he tries to analyze the opponent and take them down as quickly as possible through quick hits. Even thoughthe has a lot of simple Pins, he feels he can utilize them and make them act as if they are special. Leo[Teleport, Unbranded]: Pretty self explanitory. Kuno taps the Pin, and teleports a short distance to the desired destination. Electric Warning [Lightning Arrester, Mus Rattus]: You didn't think he had a lot of electric shaped apparel for nothing did you? Kuno uses the Pin as a medium and fires a thunderbolt through it. Kaleidoscope [Burst Rounds, Lapin Angelique]: Kuno uses the pin as a medium to charge and release a powerful blast of energy. Skull Rabbit [Force Rounds, Lapin Angelique]: Similar to Kaleidoscope, Kuno uses the pin as a medium to fire multiple, faster, and less powerful shots of energy at an opponent. Mitama [Vortex Saber, Jupiter of the Monkey]: Kuno uses the pin to slash and release a shockwave in a circular motion, this mostly serves as a defense mechanism to deflect attacks but also doubles in offense. Murasame [Vulcan Uppercut, Jupiter of the Monkey]: Kuno moves in, and uses the Pin to release a powerful, upward strike that hits three times. Kuno usually tries to use this or Electric Warning as "Finishing" attacks. P.S. : let me know if the whole "Unbranded" thing is breaching the rules.